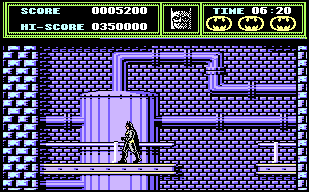 Ocean's 1989 movie tie-in game, Batman - The Movie, was based around the Michael Keaton film (still my favourite of the series!) that was released earlier the same year. Using your trusty Bat-Rope and other weapons, including giving those baddies a good punch in the face, the Caped Crusader battles his way through a series of platform-based levels, interspersed with some pretty decent quality mini-games too.